We have been adopted! It's a New Year's dream come true! This loving special-needs couple has all the strikes against them. Their chances of being adopted are very slim. Can you help them? Linus is a 3 year old -mini-lop, neutered lop who is e.cunniculi positive and has a sever head tilt. Linus was dumped off at the San Francisco shelter by his guardian who requested that Linus be euthanized, since he was no longer wanted. According to medical records left with Linus at the shelter,he has had head tilt for the majority of his life, since he first got affected when he was only 6 months old. Linus has an amazingly sunny and happy disposition and runs in excited , little circles to greet you or see his new girlfriend Odette (more about her soon). We almost didn't rescue Linus. I happened to be at the shelter when Linus was surrendered and was given the chance to meet and evaluate him. He was so incredibly depressed that he had clearly given up hope on ever being safe and loved. He was huddled in a corner and wouldn't turn to face me or the world. I spent an hour talking with him and just letting him know that he had choices. If he was ready to go, I would leave him and he would be put down. if he wanted to give life one more chance I would be there with him to help him heal and make sure no one ever hurt or abandoned him again. It was his choice. Sometimes when rabbits reach the stage that Linus was at it is hard to pull them back from the abyss of grief and hopelessness. After nearly an hour with little response from him, I communicated to him that I needed to leave soon and asked him to give me a clear sign of what he wanted and I would respect his wishes, though it might be hard for me to leave him behind. As I started to get up to leave, he ran over to the front of the cage and rested his head on my hand. It was the first time he had even looked at me. I gently rubbed his forehead and stroked his ears. He was dirty and matted from being neglected, but I told him he was handsome anyway, because in a sense he was. Very honest. very vulnerable. Here was a little being at his most genuine self. I took him home and we cleaned him up and he perked up very quickly. We soon realized what a funny, spirited guy he was! For several months he recovered in a foster home with some wonderful people. They tried to integrate him into their existing rabbit family, but the male would not accept him, so sadly he came back to SaveABunny to find a home. As hard as we try at SaveABunny, we are still a "shelter", versus a foster home where the rabbits have a human all to themselves. I wanted Linus to be happy and I also had another special needs bunny who I loved and quite frankly felt sorry for, named Odette, I decided to try to pair them, so they could at least keep each other company. The sad reality is that disabled bunnies like Odette and Linus may never have the good fortune to find a home of their own. They may live out their lives in our shelter, so I wanted to give them every chance possible for happiness even though it is a distant second from having their own family to love them and own home in which to relax and play. 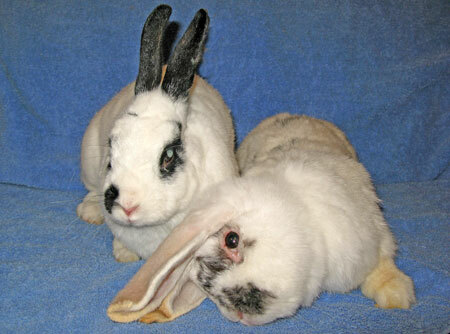 When she arrived at SaveABunny she had a cataract on one eye. It was only a few weeks (probably from stress) that she developed a cataract on her other eye leaving her virtually blind. She can probably sense darkness and light and shapes. Her eyes are now a beautiful silver color. Odette is very responsive to being talked with and can quickly adapt to her surroundings. She is a loving girl who lived well with a three -year old child, and she really deserves to live out her twilight years with people who will give her the love and tenderness she so deserves. She also takes good care of Linus and grooms him. We'll often find them snuggled head -to-head with Linus having one floppy ear draped over Odette. Odette is very neat. Linus is not. We are hoping that some kind soul out there will fall in love with these two gentle and loving bunnies and give them a home of their own where they can just be who they are. Linus is sweet, but kind of a slob and Odette just wants to be able to feel safe and know where she is and then will relax and enjoy the love you give her. Can you please help us give these two incredible bunnies the type if happily ever after that makes everyone so happy? We need your compassion and help to give these gentle bunnies a long and happy life. Adopter will receive free lifetime hay. Can you help us write the happily ever after story for Odette and Linus?